Honey-Lime Grilled Chicken - chicken breasts marinated in lime juice, honey, rosemary, garlic and thyme. Grilled to perfection! This was SO good - juicy and packed full of flavor! I found this chicken recipe on Pinterest (my favorite source for inspiration). I was excited to give this recipe a try since it uses limes. We eat a lot of lemon chicken, but not a lot of lime chicken. This chicken couldn't be easier. Just mix up the marinade, let the chicken marinate a few hours or overnight and grill. The chicken was really, really good. It was extremely moist and flavorful, and we really loved the slight sweetness from the honey. We will definitely be making this again! Combine lime juice, oil, honey, thyme, rosemary, garlic and pepper. Pour it over chickens in a ziplock bag. Refrigerate for at least 3 hours up to overnight. 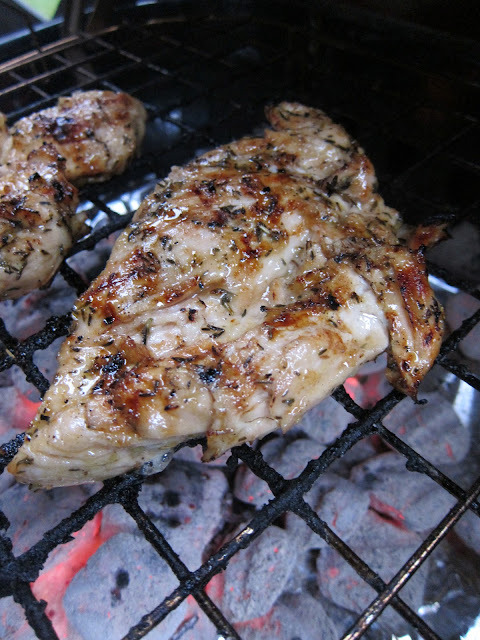 Remove chicken from marinade and grill until done and juices run clear. I can see why you like that site. You've been putting out some great looking food! The first meal my husband ever cooked for me was on Valentine's day while we were dating. He made honey lime chicken and it was love at first bite!! Delicious! This chicken looks absolutely amazing! I want to eat this every night for dinner! I know the primary flavor was lime but I don't think you can beat thyme for great grilled chicken. I agree with Chris. Love the honey and lime and then with thyme??? yum. Elizabeth - you can use canola oil or olive oil. I usually use olive oil. I agree with the comment above. Would oven or skillet work ok? Hi, I notice some other people asked this question, but I do not find a response, so I will ask the same thing. Can you make this in the oven, and at what temperature and time. Thank you so much. I cut the ingredients in half and baked 2 chicken thighs in the oven at 375 F for an hour. Because I got busy the meat marinated for two days in the frig and I included the zest in the marinade but left out the thyme and rosemary because I forgot it. Did the garlic. That lime made all the difference in the world to the flavor of the chicken. It was so good that I'm setting up to make it again this week for dinner. This looks delicious! Thanks for posting the recipe. Did you use bine in skin on breasts, or boneless, skinless breasts? Elizabeth - I used boneless skinless chicken breasts. Hope you enjoy it! I think thighs and drumsticks would be delicious! Enjoy!